Artrak Australia specialises in all aspects of curtain tracks and components, we are the world leaders in curved & arched tracking systems. We offer a wide range of products, personalised service and quality workmanship. All of our components are made to the highest quality standards and we employ innovative designs throughout our range. Our core aim is to simplify the task of dressing windows, using timeless classic design and quality components. We make any hard to dress window easy. Established 1978 Artrak is Australian designed, owned & manufactured. 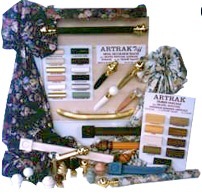 Insist on ARTRAK drapery hardware. Think it can’t be done, ARTRAK CAN! We offer the best value on simple tracks and include many finishes ie. Antique-Suede-Matrix with a variety of stains available or unstained to finish your self. ARTRAK can cord timber fascias…can’t be done, ARTRAK CAN! Check out our video for more exciting information or contact us +61 9457 4508 Insist on ARTRAK, the Australian made, owned & designed world leaders in bending metal & wooden decorative drapery tracks.